Elliptic curves are of central importance in computational number theory with numerous applications in such areas as cryptography primality testing and factorization. This book presents a thorough treatment of many algorithms concerning the arithmetic of elliptic curves complete with computer implementation. 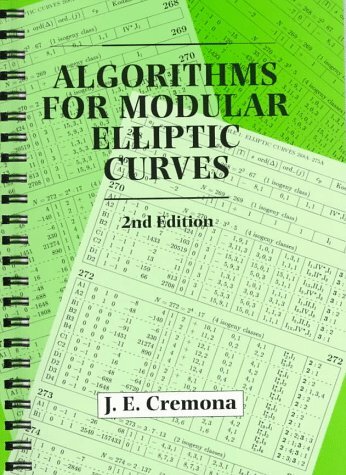 In the first part the author describes in detail the construction of modular elliptic curves giving an explicit algorithm for their computation. Then a collection of algorithms for the arithmetic of elliptic curves is presented, some of these have not appeared in book form before. Finally an extensive set of tables is provided giving the results of the author's implementations of the algorithms. This is a book combining two essays: 'Continuity and irrational numbers' - Dedekind's way of defining the real numbers from rational numbers; and 'The nature and meaning of numbers' where Dedekind offers a precise explication of the natural numbers.